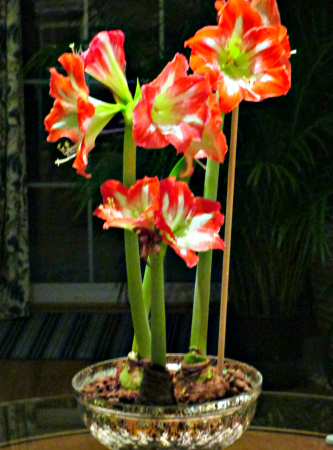 Amaryllis are popular because they're showy and easy to grow. They willingly produce large and colorful blooms in the middle of winter, making them a welcome addition to any home or office. You'll love growing Amaryllis in our hydroponic system because it's so much cleaner and easier than growing in soil. Our system replaces all that messy potting soil with clean and easy to use LECA pebbles. And growing is easy because a water gauge tells you when and how much to water. Start enjoying all the benefits of growing Amaryllis in our hydroponic system today! Amaryllis bulbs are from the Hippeastrum family and are native to the tropical and subtropical region of the Americas. They commomly grow in dry areas that have cool weather most of the year. The Amaryllis bulbs sold today are hybridized versions of the plants that grow naturally. Hybridized bulbs are stronger and more durable than than the originals and are easy growers in conditions fund in most homes. Today's bulbs produce abundant flowers and can be grown year after year. The bulbs you buy are in a dormant state and been "prepared" for blooming. That means they've just spent 6 weeks in complete darkness with temperatures in the 40 -50 degree range. This resting period "prepares" them for the blooming season ahead. Introducing them to moisture and warm sunlight brings them to life.